BRG1 Chromatin Remodeler: A New Target for the Treatment of Highly Aggressive and Malignant Brain Tumors? The self-renewing glioma-initiating cells (GICs) present within the highly aggressive and malignant brain tumor glioblastoma multiforme (GBM) possess tumor-initiating capacity and may facilitate drug resistance . An exploration of the signaling pathways and transcriptional networks that control the neural stem-cell-like characteristics of GICs may provide novel, druggable therapeutic targets; an exciting prospect given the often dismal prognosis for GBM patients. In a new STEM CELLS study, researchers from the laboratory of Lawrence M. Pfeffer (University of Tennessee Health Science Center, Memphis, TN, USA) explored the role of Brahma-related gene 1 (BRG1), a catalytic subunit of the SWI/SNF chromatin remodeling complex, in GICs. Previous studies had uncovered links between BRG1 and pluripotency [2, 3], BRG1 transactivation of pluripotency-associated genes , the overexpression of BRG1 in glioma , and the correlation of high BRG1 expression and poor prognosis/tumor aggressivity . Now, Ganguly et al. report that BRG1 helps to maintain the neural stem-cell-like identity of GICs by promoting glycolysis, while knockdown of BRG1 promotes GIC differentiation and sensitization to chemotherapeutic drugs . Have the authors discovered a new and effective means to treat GBM? Initial analysis of GICs derived from three independent GBM tumors uncovered robust expression of BRG1 in all samples, suggesting a link between BRG1 expression and the stem-cell-like characteristics of GICs, while knockdown (KD) of BRG1 expression with a lentivirally transduced short hairpin (sh)RNA downregulated stem cell marker gene expression and enhanced astrocytic differentiation. When compared to control GICs, BRG1-KD GICs displayed increased proliferation in vitro and in vivo, as a consequence of GICs leaving their normally quiescent dormant state, and this led to the rapid development of larger tumors following intracranial injection into model mice. 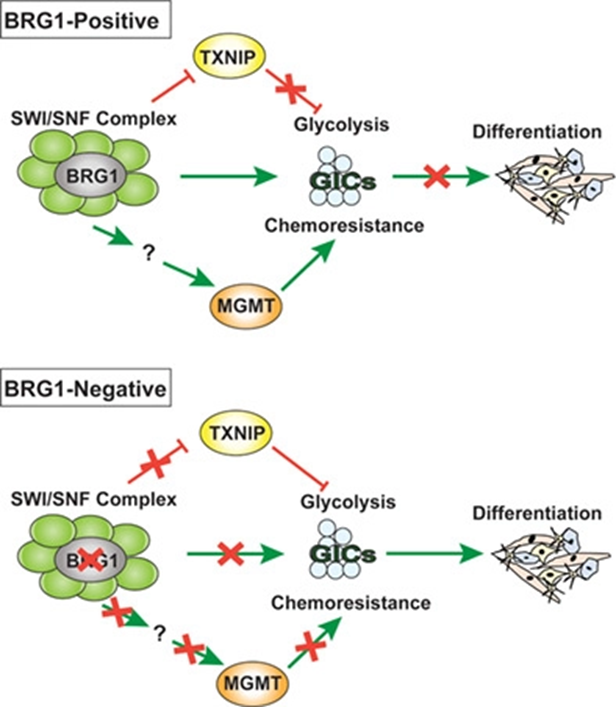 Mechanistically, the authors discovered that BRG1 potentially maintains glucose availability in GICs by downregulating the expression of TXNIP, a negative regulator of glycolysis involved in redox regulation, in a STAT3-dependent manner. However, the most exciting part of the study compared the response of GICs with and without BRG1 expression to the alkylating agent TMZ, a front-line chemotherapy for GBM treatment . While some GICs displayed high resistance to TMZ (linked to O6‐methylguanine methyltransferase (MGMT) expression), the authors discovered that the shRNA-mediated downregulation of BRG1 in GICs induced TMZ sensitization. Furthermore, treatment of GICs with PFI-3, a competitive inhibitor of the SWI/SNF catalytic component with higher affinity for BRG1 than BRM , also led to an increased sensitivity to chemotherapeutics, suggesting that a combinatorial approach may provide enhanced anti-GBM results in human patients. Overall, this new study establishes the BRG1 chromatin remodeler as a target for the development of GIC-centered therapeutic approaches for the highly aggressive and malignant GBM brain tumors. For more on stem-cell-like cells in cancer development and new and effective anti-cancer regimens, stay tuned to the Stem Cells Portal! What are the other mechanisms involved following BRG1 loss in GICs? Is BRG1 pharmacological inhibition suitable for application in human patients and could unwanted side-effects hamper this approach? Do chromatin remodelers represent a target for anti-cancer therapy in the stem cells of other solid cancers? Bao S, Wu Q, McLendon RE, et al., Glioma stem cells promote radioresistance by preferential activation of the DNA damage response. Nature 2006;444:756-60. Zhang X, Li B, Li W, et al., Transcriptional repression by the BRG1-SWI/SNF complex affects the pluripotency of human embryonic stem cells. Stem Cell Reports 2014;3:460-74. Ho L, Miller EL, Ronan JL, et al., esBAF facilitates pluripotency by conditioning the genome for LIF/STAT3 signalling and by regulating polycomb function. Nature Cell Biology 2011;13:903-13. Bai J, Mei PJ, Liu H, et al., BRG1 expression is increased in human glioma and controls glioma cell proliferation, migration and invasion in vitro. Journal of Cancer Research and Clinical Oncology 2012;138:991-8. Guerrero-Martinez JA and Reyes JC, High expression of SMARCA4 or SMARCA2 is frequently associated with an opposite prognosis in cancer. Scientific Reports 2018;8:2043. Ganguly D, Sims M, Cai C, et al., Chromatin Remodeling Factor BRG1 Regulates Stemness and Chemosensitivity of Glioma-Initiating Cells. Stem Cells 2018;36:1804-1815. Lee SY, Temozolomide resistance in glioblastoma multiforme. Genes & Diseases 2016;3:198-210. Fedorov O, Castex J, Tallant C, et al., Selective targeting of the BRG/PB1 bromodomains impairs embryonic and trophoblast stem cell maintenance. Science Advances 2015;1:e1500723.